The bill is predicated on the fact that existing fossil power plants can’t compete with other resources on cost. Increasingly affordable wind and solar power are rendering an ever-larger share of the United States’ existing thermal power plants uneconomic. Aging coal-fired power plants are especially vulnerable in this head-to-head, brown-versus-green matchup. Policymakers across the country are now grappling with how to reduce the cost of sending money-losing fossil power plants to an early retirement while softening the potentially negative blow to ratepayers, as well as to affected workers and communities. In Colorado, a state lawmaker is pushing a proposal he believes strikes the right balance in achieving all those aims. 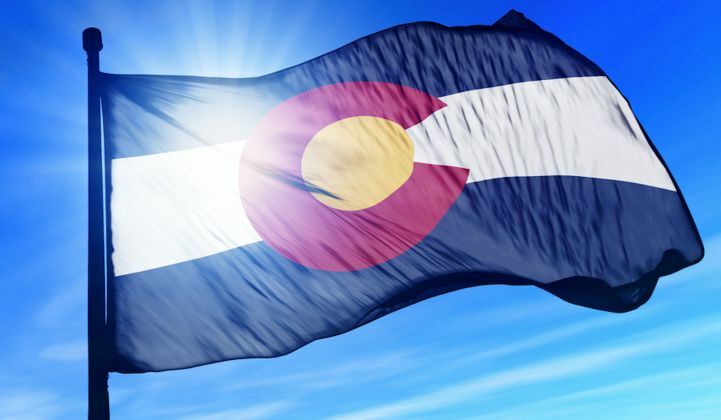 In January, Chris Hansen, a Democratic member of the Colorado House of Representatives, introduced the “Colorado Energy Impact Assistance Act” (HB 1037). The legislation is an updated version of a bill Hansen introduced in 2017. That bill passed the House but died in the then-Republican-controlled state Senate. In an interview with Greentech Media, Rep. Hansen explained that the bill does two things: It uses a ratepayer-backed bond mechanism — securitization — to address the stranded asset problem in the power sector, and it reserves some of the savings generated from that bonding transaction to help workers and towns where the retirements occur. Hansen’s bill is predicated on the fact that in states like Colorado, blessed with an abundance of low-cost wind and solar power resources, existing fossil power plants can’t compete on cost now and in the future. In an interview with GTM, Ronald Lehr, an independent consultant and former Colorado Public Utilities Commission chairman, said it was clear by 2013, in the Public Service Company of Colorado’s own analysis, that adding wind and solar power to the grid lowered the cost of service for the utility’s customers. The Public Service Company of Colorado is an Xcel Energy subsidiary and the state’s largest utility. Working with Uday Varadarajan, a researcher then with the Climate Policy Initiative and now with the Rocky Mountain Institute, Lehr and colleagues used publicly available financial data to analyze whether Colorado’s coal-fired power plants were operating at a profit. For Lehr, the discovery prompted a question: How do you get these uneconomic plants off the rate base at the lowest cost? “Utilities don’t want to give them up because they’re earning on the equity,” he said. They needed a way to get the equity out of the equation. Securitization — replacing the equity with low-cost debt secured via the utility’s healthy credit rating — looked like a good option. As a sweetener for the utility to give up the equity in a rate-based power plant, HB 1037 permits utilities to own at least some of the replacement generating capacity. In a series of policy briefs co-authored with Mike O’Boyle, director of electricity policy for the think tank Energy Innovation, Lehr highlighted a suite of financial tools utilities could employ to trade “steel for fuel” and hasten the retirement of coal plants. Lehr and his collaborators brought the concept to Chris Hansen. Hansen is a state lawmaker uniquely qualified to run with such a proposal. He holds a doctorate in energy economics from Oxford and was in the power sector analysis group for much of the decade he worked at the consultancy IHS CERA. “Him explaining it to his fellow legislators was a thing of wonder to watch, because their eyes crossed and rolled back in their heads,” said Lehr. Rep. Hansen said more than 20 U.S. states have employed some form of securitization when shuttering power plants. The different tack taken in HB 1037 is the assistance provided for displaced workers and towns with job losses. Under the bill, 15 percent of the net present value of savings generated by the closure of a power plant — such as fuel not burned, as well as avoided maintenance and operating costs — would be directed to a new seven-member, governor-appointed body, the Colorado “Energy Impact Assistance Authority,” to be used for transition assistance for workers and communities. The process would be entirely voluntary. “It is at the sole discretion of the utility to bring the financing order forward” to the PUC, said Hansen. In Colorado, “cost-effective generation” means renewables. As of last year, Xcel Energy solicited median bids ranging from just $18.10 per megawatt-hour for standalone wind power to $36 per megawatt-hour for solar-plus-storage. “In many areas, the incremental cost of renewable generation is currently less than the embedded cost of existing generation,” Jonathan Adelman, vice president of strategic and resource and business planning at Xcel Energy, told GTM in September 2018. In an email, Mark Stutz, a spokesperson with Xcel Energy Colorado, confirmed that the utility has not taken a position on HB 1037. Stutz said provisions in Colorado’s 2010 Clean Air-Clean Jobs Act have enabled Xcel Energy Colorado to replace retiring coal-fired generation and ensure a transition for affected workers. “We have had virtually no issues with addressing workforce at our facilities, as employees have been able to find positions in other parts of the company, chosen to retire, or found other opportunities,” he said. Under the Colorado Energy Plan, which was approved by regulators in August 2018, Xcel Energy accelerated the retirement of 660 megawatts of coal capacity, and will replace it with more than 1,800 megawatts of wind and solar PV and 275 megawatts of battery storage. In December, Xcel Energy built upon its Colorado plans by committing to 100 percent carbon-free electricity across its entire service territory by 2050. In an email, Geoffrey Hier, director of government relations for the Colorado Rural Electric Association, said CREA is likewise monitoring HB 1037 and has not taken a position on the bill. Rep. Hansen told GTM a sticking point in his conversations with utilities about HB 1037 has been over how much ownership of new generating capacity utilities will be guaranteed when they seek to replace power from retiring coal-fired power plants. Hansen noted that the Colorado Energy Plan ended up with Xcel Energy owning about one-third of the new generating capacity, with the rest developed and owned by thirty-party developers. The political circumstances appear to be more favorable for Rep. Hansen’s second attempt to pass a coal plant retirement bill. Democrats took control of the state Senate in the November 2018 election, and Colorado’s new Democratic governor, Jared Polis, has signaled his strong support for HB 1037. Polis followed that with what sounded like explicit support for HB 1037. “Creative financing mechanisms that exist today can ensure that consumers pay lower rates as we move to renewables, and help provide for a transition that is just and fair both for workers and for communities directly impacted,” he said. “The governor was very supportive during the campaign, and then after the inauguration, that he’d like to see this tool put in place,” said Rep. Hansen. HB 1037 has already passed out of the House of Representatives. Hansen said he expects his Senate colleagues to take up the bill in a few weeks, after completion of the state budget. The end of the current legislative session is May 3. Regardless of the fate of HB 1037 in Colorado, word of Hansen’s coal plant retirement formula is reaching beyond the state’s borders. Hansen said he is “actively talking” to colleagues in Minnesota, Utah and Montana about the proposal. The 100 percent clean electricity bill signed by New Mexico Governor Michelle Lujan Grisham last week includes a provision allowing utilities to issue bonds to cover the cost of shuttering coal plants and supporting affected workers.